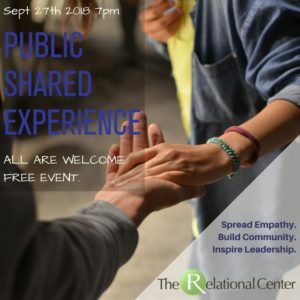 A demystifying “Shared Experience” event to create more space for love and meaningful connection in the age of digital distractions. “Shared Experience” in terms of everyone has a role in the experience. Think of it like a yoga class for relating. Cost to Attend: Free to TRC members with an encouraged small donations of $10 for non-members. What to Bring: Bring a Friend. You might want to take some notes but other than that, just come as you are. To experience the benefits of feeling understood, seen and connected to others. To practice and learn techniques to use for deeper conversations with friends and loved ones. Plenty of Street Parking on Side Streets.